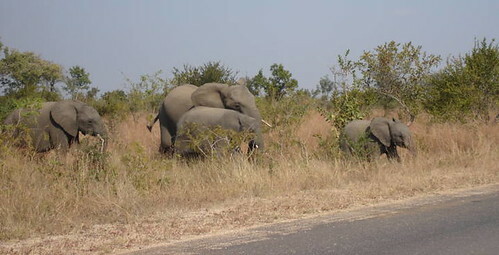 We aimed to get to Kruger National Park as early as possible so that we could spend the day driving to our camp site. 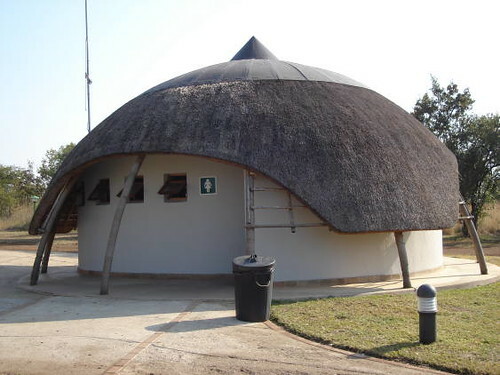 Kruger has a number of different entrances, we entered through Phabeni Gate. We had to go and register at the reception centre. Yes I know my horizon is sloping off into the distance again…and I made use of the world’s grooviest public toilet. 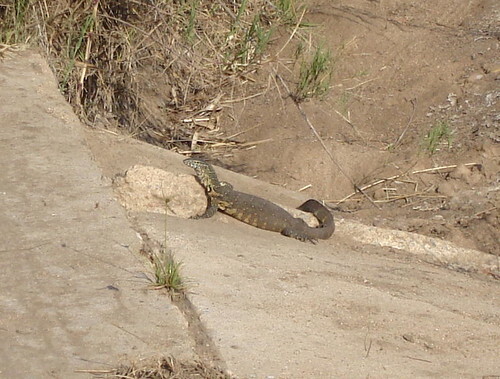 a very cool rock monitor. 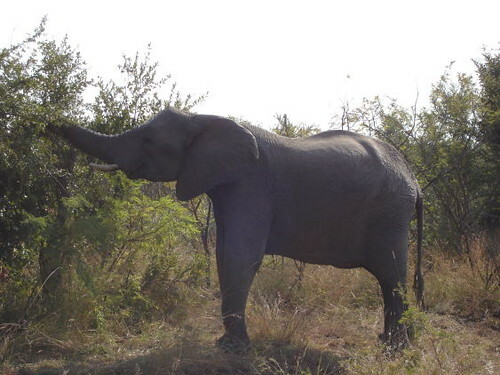 and eating, elephants eat a lot! I don’t want to overload you with pictures, so more in the next post. If you’d like to see pictures from the other side of the car check out Gorgeous Man’s blog which I’m sure he will be updating soon. Our Great Trek north is over and we are back safely. If you are here for knitting and quilting content you may want to check back in a week or so since I’m going to talk about Kruger for a bit. 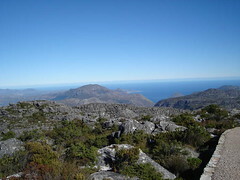 The trip from Cape Town to Kruger is just a little longer than the drive from Brisbane to Melbourne, so getting there was an adventure in itself. 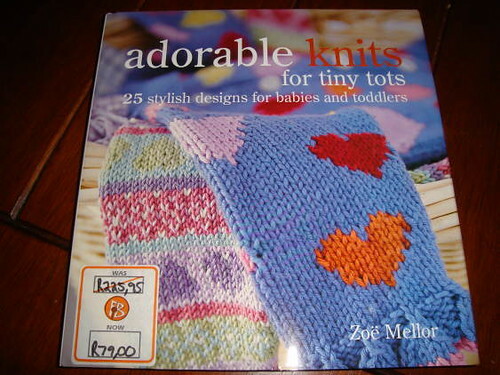 Finding an open bookstore after dinner in Bloemfontein and discovering this book on sale. See the price reduction? R225 to R79. I am so in love with some of the patterns in here, now to find yarn suitable substitute yarn…I made the comment (tongue firmly in cheek) to Gorgeous Man, that now I needed to find a yarn store (quilting fabric stores are much harder to find and are often run out of someone’s home, so it’s not worth even mentioning them) to make the holiday complete. His feeling was that we would be very lucky to find a yarn store as we weren’t frequenting that sort of area. After a night in the second worst hotel* we’ve ever stayed in (the mattress was so compressed at the head that it felt like you were sleeping on a down hill slope) we went to a local shopping area to withdraw money. The armoured truck was there busy filling the machine, and after the guard asked me to stand further away from the area as ‘it is dangerous’ (cash heists are quite common here), I went to sit in the car. Guess what I spotted from my car? Way down at the end of the complex was an Afrikaans word I do know: WOL. Gorgeous Man sighed (only a little) and off we went. There was stash enhancement, but not much. 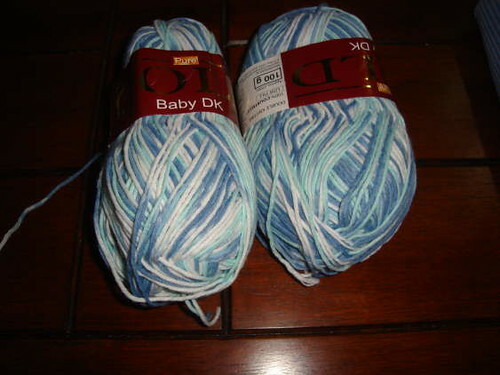 It will make a cute jumper, or hat. * Seeing a police car pull over to allow a car travelling at about 150 – 160km per hour pass. I laughed for about 10 minutes over that one. It is a custom here that if a car faster than you comes up behind you you should pull over to the shoulder and let them past. The police had passed us about 5 minutes before, we were going about 130 (speed limit is 120). 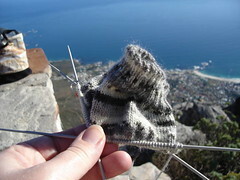 The first of Gorgeous Man’s socks was grafted. After much trying on and discussion I’ve discovered that the foot is perfect, as is the heel, but the leg is a little baggy. I consulted the Yarn Harlot’s Knitting Rules and I figure I know how to make the calculations to make the next pair absolutely perfect. We visited Pilgrim’s Rest which was nothing like the websites or the books describe. It was actually a bit sad and depressing. Beware of the guys who wash your car without asking and then expect payment. We got to Kruger fairly early Thursday morning, but that is a post for tomorrow. 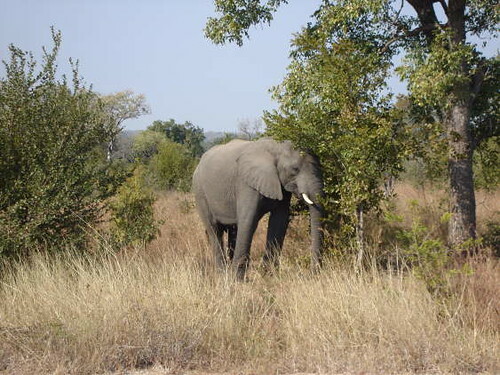 We are heading off to commune with the Big Five in Kruger Park. Pictures of animals, and hopefully some finished knitting (we’ve got 2 days car travel each way) when I get back. Yesterday we graduated our latest batch of English students, some are leaving and some are going up to the next level. 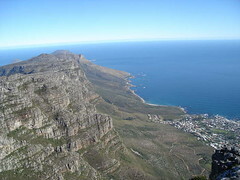 We then took them to Table Mountain for the afternoon. We had the perfect day. The weather has been very inclement lately and yesterday was only the second time in a week that the cable car had been running and the mountain open to the public. Here’s the view from the top. The colour of the sea and sky are untouched, just straight from my camera, and yes, I have trouble with horizon shots, mine seem to always be sloping away. The top of the mountain was much flatter than I expected and the building that has been done up there is very well done. It’s been kept to a minimum: water saving toilets, a fancy restaurant, a cheaper self-serve restaurant and a gift store, and all the buildings are on a lower level so that they don’t interrupt the view, except of course the docking station for the cable car. Because of the recent rain there were lots of pools of water in the crevices of the rock. We didn’t have long enough, it’s really worth taking the whole day. There was time for homage to the Yarn Harlot though. 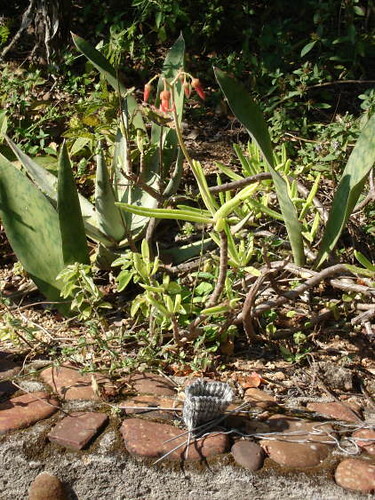 A travelling sock. I will not discuss the reactions of those around me, let’s just say there was some scuttling away from the crazy woman with the pointy sticks. I did refrain from shouting “Don’t jump” to the sock – so that was something. Unfortunately, the sock pictured above is no longer with us in that incarnation. Closer inspection, and comparison with Gorgeous Man’s store-bought socks confirmed my suspicions that, since he does not have legs like tree trunks, the sock was going to be too wide. 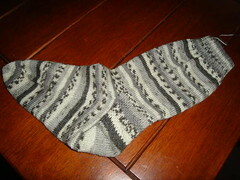 He also requested a longer ribbing so it was frogged and a new sock cast on last night. No picture, you don’t need to see 1 1/2 inches of ribbing. In a surprise move, the students presented me with some gifts for the baby yesterday. I’m not leaving yet, but some of them are, it was very thoughtful, and very unexpected. Very, very cute denim overalls and some other clothes. They told me I’d made it hard because I don’t know the gender of the baby. 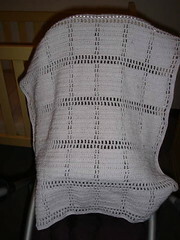 One of the gifts is a very pretty receiving blanket in pale green. I’m planning on appliquing something onto it (probably a caterpillar) and redoing the edging with variegated embroidery thread to jazz it up a bit. I’d been planning to buy one to do this on, so it was very cool to get one as a gift. 32. Engaging the Enemy by Elizabeth Moon. This is the third book in an excellent science fiction series. Some of you have asked about the pattern I used for the baby’s blanket. It comes from a pattern leaflet/book called Huggy Snuggy Baby Afghans and was printed by the American School of Needlework. I bought it in Spotlight in Australia a few years ago. If you can’t get the pattern and would like to make on, let me know and I’ll give you a rough idea of stitch and row numbers. I haven’t forgotten that I did tell some of you that I would write up some recipes on the blog – they’ll get done sometime this week. 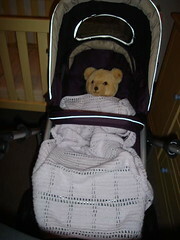 This weekend was very wet and cold, so we stayed home and puttered round the house. We moved the bookshelf out of the nursery (well Gorgeous Man carried it, I just shifted a few books) to give it a little more space. Now we need to find some thing to store the offspring’s books in. For someone who hasn’t been born yet he/she has quite a collection. Some of the books belonged to Gorgeous Man when he was young, and we have been buying children’s books for years – just so nieces and nephews had something to read when they came to visit mind you. I finished the buffalo quilt block this weekend. and no, I won’t be showing you the reverse…The pattern is from an American Family Circle Magazine compilation of knitting patterns. I’m also still working on a charity sweater and I cast on a pair of socks for Gorgeous Man. It’s been very cold here so some nice warm socks are in order. I want the socks to fit perfectly so I’m trying the Yarn Harlot’s sock recipe from Knitting Rules. Hopefully they will fit ok. I’ll post a progress picture when it is a little more interesting than just a few rows of ribbing. I’m using local sock yarn and it seems to be much thinner than the last lot I used. 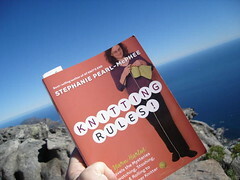 Knitting is certainly becoming more popular here. The number of fake fur/unfun fur scarves around is unbelievable. I also came across knitting yarn in the supermarket this week. Fake fur scarf kits, but knitting in a mainstream store nonetheless! By the time we leave South Africa it may not be so hard to source quality yarn… (we’ve got 4 1/2 years of Gorgeous Man’s contract still to run). Spare a thought for the folks in Australia this week. I went to university in one of the areas that has been hardest hit, and still have friends there, so it’s quite close to my heart. I know that, what with the drought and all, they needed rain, but this is just a little excessive. Thanks for all the lovely comments about the offspring. It was nice to hear from some new commenters too. 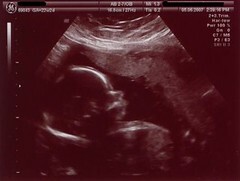 The offspring has become quite active over the last few days, and it’s quite reassuring to feel him/her moving around. I’m now getting a lot of unsolicited advice -I smile nicely, and nod politely and then ignore most of it. No pictures today, all of the WIPs are at the boring stage. I worked on a charity layette last night and ended up frogging it and starting again. Realised that I had read 3 1/4 instead of 3 3/4mm needles for the cast edge and this was why it was curling and looking disgusting. After casting on again with the right size needles it looks much better, but an inch of garter stitch and 1/2 an inch of stocking stitch is pretty boring to look at. 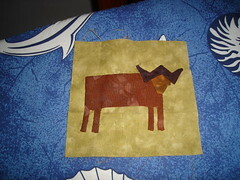 I should get the buffalo quilt block finished tonight, so pictures after the weekend. One of the things I love about Gorgeous Man is that he is interested in a wide variety of things. Before I met him I had a very limited interest in nature and birds and stuff like that, he has really opened my eyes to the wonders around me. Anyway, he has started another blog (this makes his third, I have trouble keeping up with one!) this one about animals and nature. So if you are interested in nature and bird-watching check out his new blog. Oh, and I took the photo for the header. 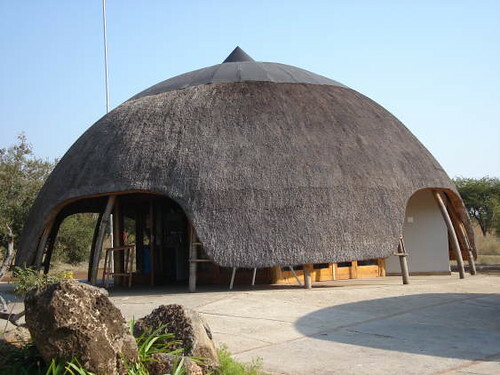 Not long now until we leave for Kruger Park. I am very excited about that. If you haven’t read any of Terry Pratchett’s stuff I’d strongly recommend it. It’s not often an author makes me laugh out-loud. 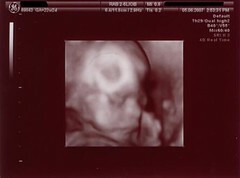 Traditional ultrasound, and here are the 3D pictures. They are quite amazing. The technology behind this astounds me. Actually the whole conception/birth process astounds me. Hopefully we won’t be seeing this doctor again. 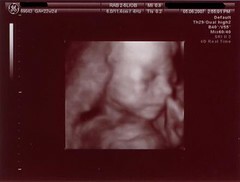 There’s nothing wrong with the doctor, but we only go back if my regular ob/gyn is worried or there are problems with the pregnancy, I’ve been very lucky so far. I finished the crochet blanket last night. It’s turned out well. This is a really quick and easy pattern and suits my crochet abilities perfectly. 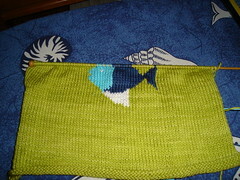 There was intarsia knitting last night, and it seems to be working. Though there’s not enough done to show pictures. Tonight is Wednesday and that means working on quilting blocks. I’m not sure how much I’m going to get done. My sore throat has morphed into the head cold from hell. I may just dose up with lemon and honey and go to bed.